Til Sudden Death Do Us Part! 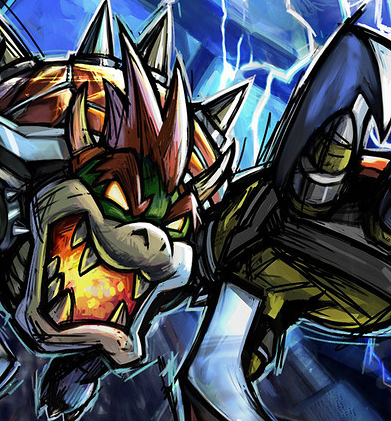 Mario Strikers Charged is developed by Next Level Games and is available for the Wii only. The game is a five-a-side football (soccer) game, using the Super Mario characters. This game is the sequel of Super Mario Strikers, and it is the last game in the Super Mario Strikers series. Characters in the game can be broken up into three groups. Captains are the leaders of their team who also have the ability of Mega Strikes and Super Ability to change the tide of a game. Sidekicks are the other memebers of your team who make up the majority of the team, each of them have diffrent stats like captains and each species has their own Skillshot. The final type is the Goalie who is a Critter, in many ways the most needed member of the team who is the last line of defense between the other teams offense and your goal. Til Sudden Death Do Us Part! Sibling Rivalry! This Monkey Shines! Battle For The Crown! Brick Wall Baby! A Stunning Situation! Three Goals Away! So Far Behind... Zero Tolerance! Tag Team Tussle! Against All Odds! Lucky Seven!